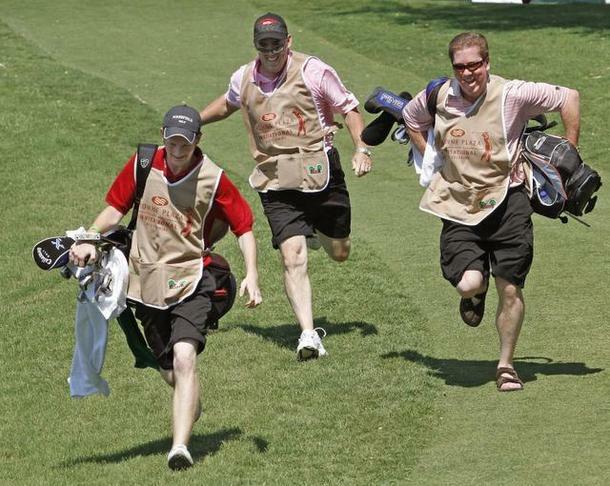 The PGA Tour should not have banned caddie races. Golf is fun to watch, if you love the game. For everyone else, its a boring excuse for entertainment. However, a few times a year at tournaments including the Colonial and Waste Management Open, golf becomes fun for everyone. The crowd cheers and laughs as caddies sprint down the fairway, it feels more like the student section at a college football game than a golf tournament. More than a golf tournament- Caddie races embody the sprit of these tournaments. A nice break from the norm, these tournaments draw a different crowd than your standard tournament. This is good for the game, it sparks interest and adds a little fun to the weekend. Everyone said its something you “have to experience”. Going to the Waste Management Tournament was on my list if things to do next year, I guess I can cross that off the list now. Why ban the races- According to a report from golfchannel.com, the PGA Tour has banned the infamous caddie races. ” …we developed a little concern about caddies’ safety.” said Andy Pazder, the Tours EVP. I understand that these days everyone is worried about injury liabilities, but is this really necessary? Do you think they are THAT worried about someone getting hurt? They should have better things to worry about like deer antler spray, putters, and fans screaming obnoxious phrases every time a player tees off. What Now?- Instead of Caddie races tournaments will search for other ways to engage the fans. One tournament has offered a boring alternative allowing fans to: “download an app on their smartphones that will allow them to guess which player out of a particular group will hit their tee shot closest to the hole.” I would travel from Atlanta to Phoenix to witness the caddie races and be a part of that environment. To vote on my iPhone? Nope. Maybe one day they will come to their senses and reverse the ruling. But, I wouldn’t count on it. What do you think? Were they right to ban the races?